Bees’ importance cannot be overstated. As TrueActivist has shared before, the tiny, bumbling insects are responsible for a lot – making them essential in the future of our planet. 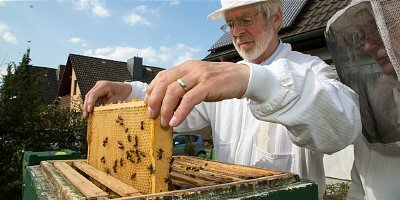 Therefore, with massive bee die-offs (otherwise known as ‘colony collapse disorder’), it has been the plight of many scientists, beekeepers, and educated activists to do whatever it takes to ensure bees survive. Some theories exist as to what is causing colony collapse, such as Monsanto’s GMO crops, the insecticides used to treat them, and EMF frequencies from excessive technological use… but debate persists. As might be expected, many pro-GMO advocates are angry about the new law, calling it “unfounded,” and stating that it “lacks scientific justification.” Many non-GMO supporters – especially beekeepers – stand strong in their stance, however, and point to the many documented dangers (and unproven suspicions) of genetically modified foods. They also bring to attention the known damage caused by herbicides and pesticides used to grow them, as well as the decimation of pollinating insects. In addition, the exposure of bees to biotech chemicals like glyphosate (which was determined to be ‘probably carcinogenic’ by the WHO’s IARC), would no doubt compromise their numbers even more.